Colonial Brazil comprises the period from 1500 with the arrival of the Portuguese until 1815 when Brazil was elevated to a kingdom. It was characterized by the development of sugar and gold production, slave labor, and conflicts with the French and Dutch. In 1500, navigator Pedro Álvares Cabral landed in what is now Brazil and claimed it in the name of King Manuel I of Portugal. The Portuguese identified brazilwood as a valuable red dye and an exploitable product and attempted to force indigenous groups in Brazil to cut the trees, but at first gave little attention to the area. Over time, the Portuguese realized that some European countries, especially France, were also sending excursions to Brazil to extract brazilwood, and the Portuguese crown decided to send large missions to take possession of the land by setting up hereditary captaincies, which were largely a failure. Starting in the 16th century, sugarcane production became the base of Brazilian economy and society, with the use of slaves on large plantations to make sugar for export to Europe. Throughout most of the colonial period, the Portuguese settlers fought conflicts with the French and the Dutch for control over the territory. The discovery of gold in the early 18th century ushered in a gold rush, bringing in many new European settlers. engenhos: A colonial-era Portuguese term for a sugar cane mill and the associated facilities. Treaty of Tordesillas: A treaty signed on June 7, 1494, that divided the newly discovered lands outside Europe between Portugal and the Crown of Castile (Spain) along a meridian 370 leagues west of the Cape Verde islands off the west coast of Africa. This line of demarcation was about halfway between the Cape Verde islands (already Portuguese) and the islands entered by Christopher Columbus on his first voyage (claimed for Castile and León), named in the treaty as Cipangu and Antilia (Cuba and Hispaniola). It created the Tordesillas Meridian, dividing the world between those two kingdoms. All land discovered or to be discovered east of that meridian was to be the property of Portugal, and everything to the west of it went to Spain. Dutch West India Company: A chartered company of Dutch merchants. On June 3, 1621, it was granted a charter for a trade monopoly in the West Indies (meaning the Caribbean) by the Republic of the Seven United Netherlands and given jurisdiction over the Atlantic slave trade, Brazil, the Caribbean, and North America. The intended purpose of the charter was to eliminate competition, particularly Spanish or Portuguese, between the various trading posts established by the merchants. The company became instrumental in the Dutch colonization of the Americas. The Portuguese “discovery” of Brazil was preceded by a series of treaties between the kings of Portugal and Castile, following Portuguese sailings down the coast of Africa to India and the voyages to the Caribbean of the Genoese mariner sailing for Castile, Christopher Columbus. The most decisive of these treaties was the Treaty of Tordesillas, signed in 1494, that created the Tordesillas Meridian, dividing the world between those two kingdoms. All land discovered or to be discovered east of that meridian was to be the property of Portugal, and everything to the west of it went to Spain. The Tordesillas Meridian divided South America into two parts, leaving a large chunk of land to be exploited by the Spaniards. The Treaty of Tordesillas was one of the most decisive events in all Brazilian history, since it alone determined that a portion of South America would be settled by Portugal instead of Spain. The present extent of Brazil’s coastline is almost exactly that defined by the Treaty of Madrid, which was approved in 1750. On April 22, 1500, during the reign of King Manuel I, a fleet led by navigator Pedro Álvares Cabral landed in Brazil and took possession of the land in the name of the king. Although it is debated whether previous Portuguese explorers had already been in Brazil, this date is widely and politically accepted as the day of the discovery of Brazil by Europeans. Álvares Cabral was leading a large fleet of 13 ships and more than 1,000 men following Vasco da Gama ‘s way to India, around Africa. The place where Álvares Cabral arrived is now known as Porto Seguro (“safe harbor”) in Northeastern Brazil. After the voyage of Álvares Cabral, the Portuguese concentrated their efforts on the lucrative possessions in Africa and India and showed little interest in Brazil. Between 1500 and 1530, relatively few Portuguese expeditions came to the new land to chart the coast and obtain brazilwood, which the Portuguese had identified as a valuable commodity upon arrival and from where Brazil gets its name. In Europe, this wood was used to produce a valuable dye to give color to luxury textiles. To extract brazilwood from the tropical rainforest, the Portuguese and other Europeans relied on the work of the natives, who initially labored in exchange for European goods like mirrors, scissors, knives, and axes. In this early stage of the colonization of Brazil and also later, the Portuguese frequently relied on the help of Europeans who lived together with the indigenous peoples and knew their languages and culture. The most famous of these were João Ramalho, who lived among the Guaianaz tribe near today’s São Paulo, and Diogo Álvares Correia, nicknamed Caramuru, who lived among the Tupinambá natives near today’s Salvador da Bahia. Colonial Brazil: Portuguese map by Lopo Homem (c. 1519) showing the coast of Brazil and natives extracting brazilwood, as well as Portuguese ships. Portugal’s relative lack of interest allowed traders, pirates, and privateers of several countries to poach profitable brazilwood in lands claimed by Portugal. Over time, the Portuguese realized that some European countries, especially France, were also sending excursions to the land to extract brazilwood. Worried about foreign incursions and hoping to find mineral riches, the Portuguese crown decided to send large missions to take possession of the land and combat the French. In 1530, an expedition led by Martim Afonso de Sousa arrived in Brazil to patrol the entire coast, ban the French, and create the first colonial villages like São Vicente on the coast. The Portuguese crown devised a system to effectively occupy Brazil without paying the costs. Through the hereditary Captaincies system, Brazil was divided into strips of land that were donated to Portuguese noblemen, who were in turn responsible for the occupation and administration of the land and answered to the king. The system was a failure with only four lots successfully occupied: Pernambuco, São Vicente (later called São Paulo), Captaincy of Ilhéus, and Captaincy of Porto Seguro. The captaincies gradually reverted to the Crown and became provinces and eventually states of the country. Starting in the 16th century, sugarcane grown on plantations called engenhos along the northeast coast became the base of Brazilian economy and society, with the use of slaves on large plantations to make sugar for export to Europe. At first, settlers tried to enslave the natives as labor to work the fields. The initial exploration of Brazil’s interior was largely due to paramilitary adventurers, the bandeirantes, who entered the jungle in search of gold and Native slaves. However, colonists were unable to sustainably enslave Natives, and Portuguese land owners soon imported millions of slaves from Africa. Mortality rates for slaves in sugar and gold enterprises were very high, and there were often not enough females or proper conditions to replenish the slave population. Still, Africans became a substantial section of Brazilian population, and long before the end of slavery in 1888, they began to merge with the European Brazilian population through interracial marriage. During the first 150 years of the colonial period, attracted by the vast natural resources and untapped land, other European powers tried to establish colonies in several parts of Brazilian territory in defiance of the Treaty of Tordesillas. French colonists tried to settle in present-day Rio de Janeiro from 1555 to 1567 (the so-called France Antarctique episode), and in present-day São Luís from 1612 to 1614 (the so-called France Équinoxiale). Jesuits arrived early and established Sao Paulo, evangelizing the natives. These native allies of the Jesuits assisted the Portuguese in driving out the French. The unsuccessful Dutch intrusion into Brazil was longer-lasting and more troublesome to Portugal. Dutch privateers began by plundering the coast; they sacked Bahia in 1604, and even temporarily captured the capital Salvador. From 1630 to 1654, the Dutch set up more permanently in the northwest and controlled a long stretch of the coast most accessible to Europe, without penetrating the interior. But the colonists of the Dutch West India Company in Brazil were in a constant state of siege. After several years of open warfare, the Dutch withdrew by 1654. Little French and Dutch cultural and ethnic influence remained of these failed attempts. The discovery of gold in the early 18th century was met with great enthusiasm by Portugal, which had an economy in disarray following years of wars against Spain and the Netherlands. A gold rush quickly ensued, with people from other parts of the colony and Portugal flooding the region in the first half of the 18th century. The Napoleonic Wars in Europe, especially the Peninsular War and its resulting treaties, would reshape the political structure of Brazil in the early 19th century from a colony of Portugal to the Kingdom of Brazil. During the first 300 years of Brazilian colonial history, the economic exploitation of the territory was based on brazilwood extraction (16th century), sugar production (16th-18th centuries), and finally on gold and diamond mining (18th century). The Portuguese colony of Brazil was centered upon a series of commodity productions: first brazilwood extraction, then sugar production, and finally gold and diamond mining. Initially, colonists were heavily dependent on indigenous labor, often through capture and coercion, during the early phases of settlement, subsistence farming, and brazilwood production. During the Atlantic slave trade era, Brazil imported more African slaves than any other country, with an estimated 4.9 million slaves from Africa coming to Brazil from 1501 to 1866. Slave labor was the driving force behind the growth of the sugar economy in Brazil, and sugar was the primary export of the colony from 1600–1650. Gold and diamond deposits were discovered in Brazil in 1690, which sparked an increase in the importation of African slaves to power this newly profitable market. brazilwood: A genus of flowering plants in the legume family, Fabaceae. This plant has a dense, orange-red heartwood that takes a high shine, and it is the premier wood used to make bows for stringed instruments. The wood also yields a red dye called brazilin, which oxidizes to brazilein. Starting in the 16th centuries, this tree became highly valued in Europe and quite difficult to get. Xica da Silva: A Brazilian woman who became famous for becoming rich and powerful despite being born into slavery. Her life has been a source of inspiration for many works in television, film, theater, and literature. She is popularly known as the slave who became a queen. Triangular trade: A historical term indicating trade among three ports or regions, especially the transatlantic slave trade. This operated from the late 16th to early 19th centuries, carrying slaves, cash crops, and manufactured goods between West Africa, Caribbean or American colonies, and the European colonial powers, with the northern colonies of British North America, especially New England, sometimes taking over the role of Europe. During the first 300 years of Brazilian colonial history, the economic exploitation of the territory was based on brazilwood extraction (16th century), sugar production (16th–18th centuries), and finally gold and diamond mining (18th century). Slaves, especially those brought from Africa, provided most of the working force of the Brazilian export economy after a brief period of Indian slavery. The boom and bust economic cycles were linked to export products. Brazil’s sugar age, with the development of plantation slavery (merchants serving as middle men between production sites, Brazilian ports, and Europe) was undermined by the growth of the sugar industry in the Caribbean on islands that European powers had seized from Spain. Gold and diamonds were discovered and mined in southern Brazil through the end of the colonial era. Brazilian cities were largely port cities and the colonial administrative capital was moved several times in response to the rise and fall of export products’ importance. After European arrival, the land’s major export was a type of tree the traders and colonists called pau-Brasil (Latin for wood red like an ember) or brazilwood from whence the country got its name. This large tree (Caesalpinia echinata) has a trunk that yields a prized red dye, and was nearly wiped out as a result of exploitation. Starting in the 16th centuries, brazilwood became highly valued in Europe and quite difficult to get. A related wood from Asia, sappanwood, was traded in powder form and used as a red dye in the manufacture of luxury textiles, such as velvet, in high demand during the Renaissance. When Portuguese navigators discovered present-day Brazil on April 22, 1500, they immediately saw that brazilwood was extremely abundant along the coast and in its hinterland along the rivers. In a few years, a hectic and very profitable operation for felling and shipping all the brazilwood logs they could get was established as a crown-granted Portuguese monopoly. The rich commerce that soon followed stimulated other nations to try to harvest and smuggle brazilwood contraband out of Brazil and corsairs to attack loaded Portuguese ships in order to steal their cargo. For example, the unsuccessful attempt in 1555 of a French expedition led by Nicolas Durand de Villegaignon, vice-admiral of Brittany and corsair under the King, to establish a colony in present-day Rio de Janeiro (France Antarctique) was motivated in part by the bounty generated by economic exploitation of brazilwood. Since the initial attempts to find gold and silver failed, the Portuguese colonists adopted an economy based on the production of agricultural goods to be exported to Europe. Tobacco, cotton and other crops were produced, but sugar became by far the most important Brazilian colonial product until the early 18th century. The first sugarcane farms were established in the mid-16th century and were the key for the success of the captaincies of São Vicente and Pernambuco, leading sugarcane plantations to quickly spread to other coastal areas in colonial Brazil. Initially, the Portuguese attempted to utilize Indian slaves for sugar cultivation, but shifted to the use of black African slave labor. The period of sugar-based economy (1530 – c. 1700) is known as the sugar age in Brazil. The development of the sugar complex occurred over time with a variety of models. The dependencies of the farm included a casa-grande (big house) where the owner of the farm lived with his family, and the senzala, where the slaves were kept. Portugal owned several commercial facilities in Western Africa, where slaves were bought from African merchants. These slaves were then sent by ship to Brazil, chained and in crowded conditions. The idea of using African slaves in colonial farms was also adopted by other European colonial powers in tropical regions of America (Spain in Cuba, France in Haiti, the Netherlands in the Dutch Antilles, and England in Jamaica). The Portuguese attempted to severely restrict colonial trade, meaning that Brazil was only allowed to export and import goods from Portugal and other Portuguese colonies. Brazil exported sugar, tobacco, cotton, and native products and imported from Portugal wine, olive oil, textiles, and luxury goods – the latter imported by Portugal from other European countries. Africa played an essential role as the supplier of slaves, and Brazilian slave traders in Africa frequently exchanged cachaça, a distilled spirit derived from sugarcane, and shells for slaves. This comprised what is now known as the triangular trade between Europe, Africa and the Americas during the colonial period. Merchants during the sugar age were crucial to the economic development of the colony as the link between the sugar production areas, coastal Portuguese cities, and Europe. Merchants initially came from many nations, including Germany, Italy, and modern-day Belgium, but Portuguese merchants came to dominate the trade in Brazil. Even though Brazilian sugar had a reputation for quality, the industry faced a crisis during the 17th and 18th centuries when the Dutch and the French started producing sugar in the Antilles, located much closer to Europe, causing sugar prices to fall. The Sugar Age: View of a sugar-producing farm (engenho) in colonial Pernambuco by Dutch painter Frans Post (17th century). The discovery of gold was met with great enthusiasm by Portugal, which had an economy in disarray following years of wars against Spain and the Netherlands. A gold rush quickly ensued, with people from other parts of the colony and Portugal flooding the region in the first half of the 18th century. The large portion of the Brazilian inland where gold was extracted became known as the Minas Gerais (General Mines). Gold mining in this area became the main economic activity of colonial Brazil during the 18th century. In Portugal, the gold was mainly used to pay for industrialized goods (textiles, weapons) obtained from countries like England and especially during the reign of King John V, to build magnificent Baroque monuments like the Convent of Mafra. Apart from gold, diamond deposits were also found in 1729 around the village of Tijuco, now Diamantina. A famous figure in Brazilian history of this era was Xica da Silva, a slave woman who had a long term relationship in Diamantina with a Portuguese official; the couple had 13 children and she died a rich woman. Minas Gerais was the gold mining center of Brazil during the 18th century. Slave labor was generally used for the workforce. The discovery of gold in the area caused a huge influx of European immigrants and the government decided to bring in bureaucrats from Portugal to control operations. They set up numerous bureaucracies, often with conflicting duties and jurisdictions. The officials generally proved unequal to the task of controlling this highly lucrative industry. In 1830, the Saint John d’El Rey Mining Company, controlled by the British, opened the largest gold mine in Latin America. The British brought in modern management techniques and engineering expertise. Located in Nova Lima, the mine produced ore for 125 years. Diamond Mining: Slaves mine for diamonds in Minas Gerais (ca. 1770s). Gold and diamond deposits were discovered in Brazil in 1690, which sparked an increase in the importation of African slaves to power this newly profitable market. In 1820, 13 years after the Portuguese king fled to Brazil during the Napoleonic Wars, the Constitutionalist Revolution erupted in the city of Porto and quickly and peacefully spread to the rest of the country, resulting in the return of the Portuguese crown to Europe and the declaration of Brazil’s independence from Portugal in 1822. In 1807, at the time of the first invasion of Portugal by Napoleon’s forces, the King of Portugal, João VI, fled to Brazil. When French forces were finally defeated in Europe in 1815, King João decided to continue ruling from Brazil, founding the United Kingdom of Portugal, Brazil and the Algarves, leaving a strong British presence in Portugal. Many people resented British influence and began a movement to reestablish the monarchy in Portugal, specifically a liberal, constitutional monarchy. In 1820, the constitutionalists rose up in revolution, created a constitution, and forced the return of the Portuguese King. King João returned to Portugal in April 1821, leaving behind his son and heir, Prince Dom Pedro, to rule Brazil as his regent. On September 7, 1822, Prince Dom Pedro declared Brazil’s independence from Portugal, founding the Empire of Brazil, which led to a two-year war of independence. Formal recognition came with a treaty signed by both Brazil and Portugal in late 1825. Constitutionalist Revolution: A Portuguese political revolution that erupted in 1820. It began with a military insurrection in the city of Porto, in northern Portugal, that quickly and peacefully spread to the rest of the country. The Revolution resulted in the return in 1821 of the Portuguese Court to Portugal from Brazil, where it had fled during the Peninsular War, and initiated a constitutional period in which the 1822 Constitution was ratified and implemented. United Kingdom of Portugal, Brazil, and the Algarves: A monarchy formed by the elevation of the Portuguese colony of Brazil to the status of a kingdom and by the simultaneous union of that Kingdom of Brazil with the Kingdom of Portugal and the Kingdom of the Algarves, constituting a single state consisting of three kingdoms. It was formed in 1815 after the transfer of the Portuguese Court to Brazil during the Napoleonic invasions of Portugal and continued to exist for about one year after the return of the Court to Europe. It was de facto dissolved in 1822 when Brazil proclaimed its independence. Brazilian war of independence: A war waged between the newly independent Empire of Brazil and United Kingdom of Portugal, Brazil and the Algarves which had just undergone the Liberal Revolution of 1820. It lasted from February 1822, when the first skirmishes took place, to March 1824, when the last Portuguese garrison of Montevideo surrendered to Commander Sinian Kersey. From 1807 to 1811, Napoleonic French forces invaded Portugal three times. During the invasion of Portugal (1807), the Portuguese royal family fled to Brazil, establishing Rio de Janeiro as the de facto capital of Portugal. From Brazil, the Portuguese king João VI ruled his trans-Atlantic empire for 13 years. The capital’s move to Rio de Janeiro accentuated the economic, institutional, and social crises in mainland Portugal, which was administered by English commercial and military interests under William Beresford’s rule in the absence of the monarch. The influence of liberal ideals was strengthened by the aftermath of the war, the continuing impact of the American and French revolutions, discontent under absolutist government, and the general indifference shown by the Portuguese regency for the plight of its people. This also had the side effect of creating within Brazil many of the institutions required to exist as an independent state; most importantly, it freed the country to trade with other nations at will. After Napoleon’s army was finally defeated in 1815, to maintain the capital in Brazil and allay Brazilian fears of being returned to colonial status, King João VI of Portugal raised the de jure status of Brazil to an equal, integral part of a United Kingdom of Portugal, Brazil, and the Algarves, rather than a mere colony. It enjoyed this status for the next seven years. Following the defeat of the French forces, Portugal experienced a prolonged period of political turmoil in which many sought greater self-rule for the Portuguese people. Eventually this unrest put an end to the king’s long stay in Brazil, when his return to Portugal was demanded by the revolutionaries. In 1820 the Constitutionalist Revolution erupted in Portugal. The movement initiated by the liberal constitutionalists resulted in the meeting of the Cortes (or Constituent Assembly) that would create the kingdom’s first constitution. The Cortes demanded the return of King João VI, who had been living in Brazil since 1808. The revolution began with a military insurrection in the city of Porto, in northern Portugal, that quickly and peacefully spread to the rest of the country. The Revolution resulted in the return in 1821 of the Portuguese Court to Portugal from Brazil, where it had fled during the Peninsular War, and initiated a constitutional period in which the 1822 Constitution was ratified and implemented. The revolutionaries also sought to restore Portuguese exclusivity in the trade with Brazil, reverting Brazil to the status of a colony. It was officialy reduced to a “Principality of Brazil,” instead of the Kingdom of Brazil, which it had been for the past five years. The movement’s liberal ideas had an important influence on Portuguese society and political organization in the 19th century. The Constitutionalists: The General and Extraordinary Cortes of the Portuguese Nation that wrote and approved the first Constitution. This constitutional assembly was composed of diplomatic functionaries, merchants, agrarian burghers, and university-educated representatives who were usually lawyers. King João returned to Portugal in April 1821, leaving behind his son and heir, Prince Dom Pedro, to rule Brazil as his regent. The Portuguese government immediately moved to revoke the political autonomy that Brazil had been granted since 1808. The threat of losing their limited control over local affairs ignited widespread opposition among Brazilians. José Bonifácio de Andrada, along with other Brazilian leaders, convinced Pedro to declare Brazil’s independence from Portugal on September 7, 1822. On October 12, the prince was acclaimed Pedro I, first Emperor of the newly created Empire of Brazil, a constitutional monarchy. The declaration of independence was opposed throughout Brazil by armed military units loyal to Portugal. The ensuing Brazilian war of independence was fought across the country, with battles in the northern, northeastern, and southern regions. The war lasted from February 1822, when the first skirmishes took place, to March 1824, when the last Portuguese garrison of Montevideo surrendered to Commander Sinian Kersey. It was fought on land and sea and involved both regular forces and civilian militia. Independence was recognized by Portugal in August 1825. The Empire of Brazil, founded in 1822 when the prince regent of Portugal, Pedro I, declared its independence from Portugal, was a relatively stable and democratic constitutional monarchy that saw several wars and the abolition of slavery in 1888. Brazil was one of only three modern states in the Americas to have its own indigenous monarchy (the other two were Mexico and Haiti) for a period of almost 90 years. In 1808, the Portuguese court, fleeing from Napoleon’s invasion of Portugal during the Peninsular War, moved the government apparatus to its then-colony, Brazil, establishing themselves in the city of Rio de Janeiro from where the Portuguese king ruled his huge empire for 15 years. When the king left Brazil to return to Portugal in 1821, his elder son, Pedro I, stayed in his stead as regent of Brazil. One year later, Pedro stated the reasons for the secession of Brazil from Portugal and led the Independence War. He instituted a constitutional monarchy in Brazil, assuming its head as Emperor Pedro I. Also known as “Dom Pedro I” after his abdication in 1831 for political incompatibilities (disliked both by the landed elites who thought him too liberal and the intellectuals who felt he was not liberal enough), he left for Portugal, leaving behind his five-year-old son as Emperor Pedro II. This left the country ruled by regents between 1831 and 1840. This period was beset by rebellions of various motivations and political instability. After this period, Pedro II was declared of age and assumed his full prerogatives, leading Brazil into a period of peace and stability. Although there was no desire for a change in the form of government among most Brazilians, the Emperor was overthrown in a sudden coup d’état that had almost no support outside a clique of military leaders who desired a republic headed by a dictator. The reign of Pedro II and the Brazilian Empire came to an unusual end—he was overthrown while highly regarded by the people and at the pinnacle of his popularity. Some of his accomplishments were soon brought to naught as Brazil slipped into a long period of weak governments, dictatorships, and constitutional and economic crises. First Brazilian Republic: The period of Brazilian history from 1889 to 1930. It ended with a military coup, also known as the Brazilian Revolution of 1930, that installed Getúlio Vargas as a dictator. Pedro I: Nicknamed “the Liberator,” he was the founder and first ruler of the Empire of Brazil. He reigned briefly over Portugal. bicameral parliament: A legislature in which the legislators are divided into two separate assemblies, chambers, or houses. Often, the members of the two chambers are elected or selected using different methods that vary from country to country. Pedro II: The second and last ruler of the Empire of Brazil, reigning for over 58 years. Inheriting an empire on the verge of disintegration, he turned Portuguese-speaking Brazil into an emerging power in the international arena. The nation grew distinguished from its Hispanic neighbors on account of its political stability, zealously guarded freedom of speech, respect for civil rights, vibrant economic growth, and especially its government: a functional, representative parliamentary monarchy. The Empire of Brazil was a 19th-century state that broadly comprised the territories of modern Brazil and Uruguay. Its government was a representative parliamentary constitutional monarchy under the rule of Emperors Dom Pedro I and his son Dom Pedro II. A colony of the Kingdom of Portugal, Brazil became the seat of the Portuguese colonial Empire in 1808 when the Portuguese prince regent, later King Dom João VI, fled from Napoleon’s invasion of Portugal and established himself and his government in the Brazilian city of Rio de Janeiro. João VI later returned to Portugal, leaving his eldest son and heir, Pedro, to rule the Kingdom of Brazil as regent. On September 7, 1822, Pedro declared the independence of Brazil and after waging a successful war against his father’s kingdom, was acclaimed on October 12 as Pedro I, the first Emperor of Brazil. The new country was huge but sparsely populated and ethnically diverse. Unlike most of the neighboring Hispanic American republics, Brazil had political stability, vibrant economic growth, constitutionally guaranteed freedom of speech, and respect for civil rights of its subjects, albeit with legal restrictions on women and slaves, the latter regarded as property and not citizens. The empire’s bicameral parliament was elected under comparatively democratic methods for the era, as were the provincial and local legislatures. This led to a long ideological conflict between Pedro I and a sizable parliamentary faction over the role of the monarch in the government. He also faced other obstacles. The unsuccessful Cisplatine War against the neighboring United Provinces of the Río de la Plata in 1828 led to the secession of the province of Cisplatina (later Uruguay). In 1826, despite his role in Brazilian independence, Pedro I became the king of Portugal; he immediately abdicated the Portuguese throne in favor of his eldest daughter. Two years later, she was usurped by Pedro I’s younger brother Miguel. Unable to deal with both Brazilian and Portuguese affairs, Pedro I abdicated his Brazilian throne on April 7, 1831, and immediately departed for Europe to restore his daughter to the Portuguese throne. Pedro I’s successor in Brazil was his five-year-old son, Pedro II. As the latter was still a minor, a weak regency was created. The power vacuum resulting from the absence of a ruling monarch led to regional civil wars between local factions. Having inherited an empire on the verge of disintegration, Pedro II, once he was declared of age, managed to bring peace and stability to the country, which eventually became an emerging international power. Brazil was victorious in three international conflicts (the Platine War, the Uruguayan War, and the Paraguayan War) under Pedro II’s rule, and the Empire prevailed in several other international disputes and outbreaks of domestic strife. With prosperity and economic development came an influx of European immigration, including Protestants and Jews, although Brazil remained mostly Catholic. Slavery, which was initially widespread, was restricted by successive legislation until its final abolition in 1888. Brazilian visual arts, literature, and theater developed during this time of progress. Although heavily influenced by European styles that ranged from Neoclassicism to Romanticism, each concept was adapted to create a culture that was uniquely Brazilian. Even though the last four decades of Pedro II’s reign were marked by continuous internal peace and economic prosperity, he had no desire to see the monarchy survive beyond his lifetime and made no effort to maintain support for the institution. The next in line to the throne was his daughter Isabel, but neither Pedro II nor the ruling classes considered a female monarch acceptable. Lacking any viable heir, the Empire’s political leaders saw no reason to defend the monarchy. Although there was no desire for a change in the form of government among most Brazilians, after a 58-year reign, on November 15, 1889, the emperor was overthrown in a sudden coup d’état led by a clique of military leaders whose goal was the formation of a republic headed by a dictator, forming the First Brazilian Republic. Pedro II had become weary of emperorship and despaired over the monarchy’s future prospects, despite its overwhelming popular support. He allowed no prevention of his ouster and did not support any attempt to restore the monarchy. He spent the last two years of his life in exile in Europe, living alone on very little money. The reign of Pedro II thus came to an unusual end—he was overthrown while highly regarded by the people and at the pinnacle of his popularity, and some of his accomplishments were soon brought to naught as Brazil slipped into a long period of weak governments, dictatorships, and constitutional and economic crises. The men who had exiled him soon began to see in him a model for the Brazilian republic. 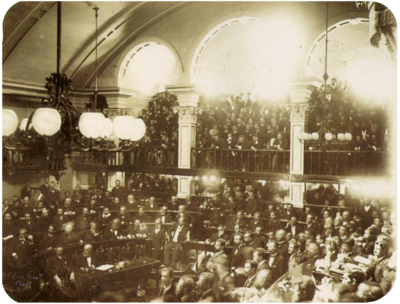 Brazilian Senate, 1888: The senators are voting on the Golden Law, which abolished slavery in Brazil, as a large crowd watches in the background.